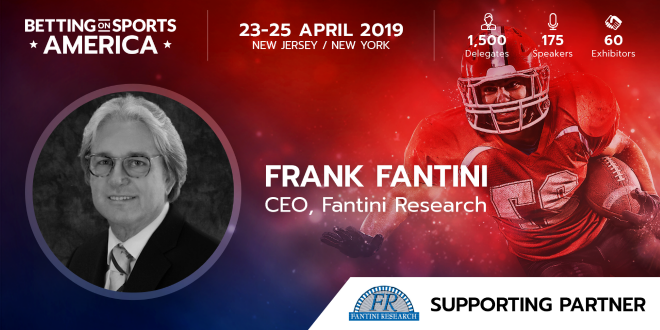 Sports Betting Community is extremely delighted to announce its new partnership with Fantini Research for the upcoming Betting on Sports America conference and exhibition, 23-25 April at the Meadowlands Exposition Center. Fantini Research publishes newsletters and provides research services for C-level executives, institutional investors and legal and regulatory professionals in the global gaming industry. The flagship product is the daily Fantini’s Gaming Report, the industry’s standard source of comprehensive and timely news and analysis. Other publications include the weekly Fantini’s Public Policy Review, the legal journal of the gaming industry providing news and analysis of legislative, legal and regulatory developments and the monthly Fantini’s National Revenue Report, a monthly compilation and analysis of US gaming revenues and trends. Frank Fantini, CEO of Fantini Research will be conducting his popular One-on-One interviews, at their designated stand (Stand 819) on the exhibition floor of BOSA, where he will be having discussions with high level delegates about the emerging markets of the US, how some of the leading industry companies see their future in this new market, industry trends plus sharing some of his knowledge from being in the gaming industry for over 25 years. SBC Marketing Director, Dennis Algreen added: ”We are absolutely delighted to have a company such as Fantini Research supporting our inaugural event in the US. A highly regarded brand in the US industry, Fantini Research is especially respected for its strong market reports and insights.